Last weekend, politicians, community partners, parent advocates and a bevy of dedicated volunteers came together to offer support to the habitually underresourced families of the Mission District. 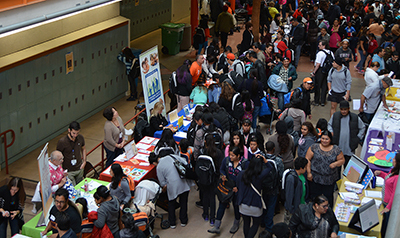 With 450 attendees — and 300 of them kids — the impact was huge. 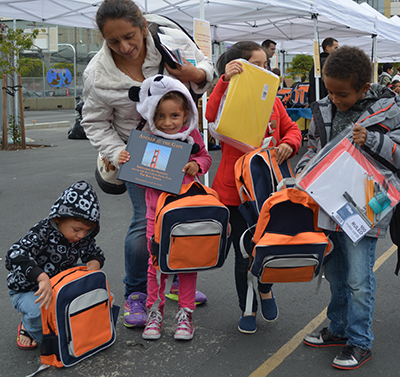 From educational workshops to partners offering free resources to supply-laden backpacks being distributed, the Mission Promise Neighborhood Education Forum 2016 was a definite success. “The community came out on a Saturday to help you get your children ready for the next school year. 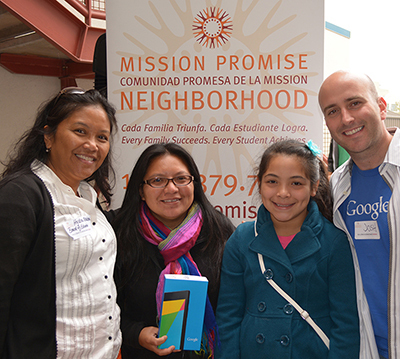 The Mission Promise Neighborhood is excited to head into our fourth school year. 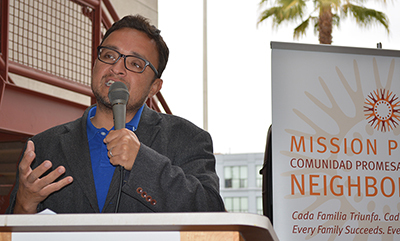 We are seeing impact and know we will see even greater successes in 2016-17,” stated MEDA Executive Director Luis Granados in his welcoming statements. MEDA is the lead agency of this education initiative. Granados was followed by Assemblymember David Chiu of the 17th District, who took to the podium toting baby Lucas, who turned 5 months old that day. Chiu explained how his parents were immigrants, as is his wife, so he understands the importance of a community making their voice be heard. He then implored the crowd to vote for this November’s Immigrant Parent Right to Vote proposition, which would allow undocumented parents to vote in School Board elections. “One-third of school parents in San Francisco currently have no say in their children’s education. When you are engaged in schools, my son, Lucas, will benefit,” Chiu explained to loud applause. Next up was Trustee Brigitte Davila of City College of San Francisco, who echoed Bell’s advice on the life-changing effect of obtaining an education. Davila was the first in her family to go to college, and she is now a professor at San Francisco State University, where she teaches government and policy classes. The final speaker was Mission Promise Neighborhood’s Lucia Obregon, who took to the podium and showed an in-depth data presentation of issues needing to be addressed in the community. Members of La Colectiva served as caregivers. One of their tasks were to feed the always-hungry children, finding a way to satisfy even those with the most finicky of palates. Univision was also in attendance, setting up a booth in the City College courtyard and handing out “Vota” bags, as the Latino station backed today’s message of the community letting its voice be heard. Univision even provided a number of keepsakes to fill the bags. Heading back to the auditorium, it was time to learn of parent advocacy. That occurred by Marco Ponce, Lourdes Dobarganes and Luz Rodríguez of the Mission Promise Neighborhood Parent Advisory Council (Concilio de Padres) taking turns at the podium — a powerful moment, as this was the first time any of them had addressed such a large crowd. Each spoke profoundly about how becoming a parent-advocate had bettered their lives, and the lives of those in the Mission community. The advocates made a call to action to those in the crowd to join the next cohort of the Parent Advisory Council, which starts this fall. The excitement then grew as ScholarShare drew names for a raffle of five Chromebooks that the nonprofit had donated. Attendees clung to their raffle tickets as numbers were called out, with audible shouts of glee from winners. Being connected to a computing device at home is important for Mission Promise Neighborhood families, so these devices were definitely appreciated … and will be well used. It was then time for distribution of supplies and backpacks. The Mission Promise Neighborhood team staffed a table of donated books, with exuberant children finding their favorites. All courtesy of the San Francisco Public Library. There were even 750 tickets doled out for free admission to the Asian Art Museum, the Exploratorium and Yerba Buena Center for the Arts. Backpacks came from combined donations: 300 from Mission Lodge 169, with Factory 2-U’s donated supplies for these backpacks running the gamut from notebooks and pens to calculators and folders; 250 from the Mayor’s Office of Neighborhood Services (MONS), 46 from DoubleDutch; and 25 from LinkedIn’s HOLA group, with these brought to Mission Promise Neighborhood offices during a recent scavenger hunt held by the tech giant’s Latino group. The stuffing of so many backpacks was made possible courtesy of the formidable efforts of Mission Promise Neighborhood staff and partner volunteers. Executive Director Edward Kaufman of Mission Graduates could be seen filling backpacks for hours. Kaufman later donned City College’s ram mascot outfit for the backpack giveaway, much to the delight of the kids — and their parents. Other partners were tabling all day, a steady stream of attendees learning of free resources to strengthen their families. Community-based organizations present included Housing Rights Committee, La Raza Centro Legal, Mission Neighborhood Centers, Mission Neighborhood Health Center and Support for Families.